GGF is a rare complication after divided RYGBP for morbid obesity. Medical management has proved grossly ineffective. Less invasive methods like fibrin glue and sealants via an endoscopic approach have been reported with recurrence rates as high as 75 %. After IRB approval and following HIPAA guidelines, we retrospectively analyzed our prospectively collected database for 2226 patients that underwent LRG for GGF after divided RYGBP between April 2001 and September 2008. RYGB divided were completed over this period as well as referred cases from outside institutions. The procedure entails dissecting out the pouch and remnant stomach, stapling off the GGF and transecting the remnant stomach at the antrum. A total of 60 cases were completed. Our patients were followed up 10 days, 2 months, 6 months and yearly after discharge. There were 51 females (85%) and 9 males (15%). The age range was between 25 and 68 (average 45), the BMI ranged between 20 and 58.7 (average 36.3).The most common indication for the procedure was pain, other indications include recurrent or persistent ulcers, weight regain, upper gastrointestinal bleed, intractable nausea and vomiting. 10 (17%) of the procedures were converted to open. We did not regard conversion as a complication but as a judgment call, opting for safer treatment. There was a 15% complication rate (9 patients) and the most common complication was leakage from staple lines. Our cumulative long term outcome suggests most patients were satisfied with the results. 4 patients (7%) complained of persistent unexplained pain. There has been no recurrence and there has been no mortality. 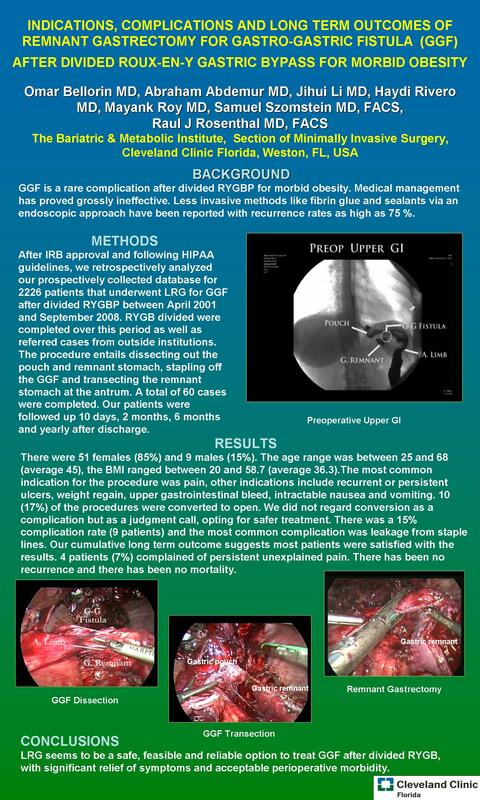 LRG seems to be a safe, feasible and reliable option to treat GGF after divided RYGB, with significant relief of symptoms and acceptable perioperative morbidity.